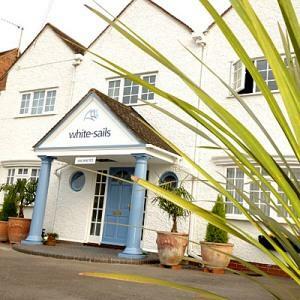 White Sails Guest HouseThis multi-award winning, luxury, boutique B&B aims to provide our guests with the best possible experience. Individually designed, climate controlled bedrooms. Fabulous state-of-the-art bathrooms complete with fluffy bath robes. Your choice of four poster, king or super king-sized bed, fitted with crisp white linen. LCD TV’s, silent fridges, guests' lounge, complimentary sherry, fully licensed to sell alcohol, Wi-Fi throughout. On-site parking and walking distance to town centre/theatre, Anne Hathaway's Cottage, racecourse. Combine all of this with warm hospitality from your hosts and a fabulous locally sourced breakfast, results in a very special experience for your stay in our region. We have 4 luxuriously appointed bedrooms, all individually climate controlled so you choose just how warm or how cool you want to be. Our aim is to provide you, our guests, with luxury and comfort during your stay not only in your rooms but also in the guests lounge and dining room. Each room is fully equipped with Sony Bravia flat screen TV’s with free to air TV and radio, silent fridges with complimentary bottled water and fresh milk for that chilled late night drink, beverage making facilities, clock radio, hairdryers, fluffy white bath robes and luxurious bathroom products for you to take away and remember us by. Two of our rooms have super king-sized beds, both of which we can offered as a twin. One room has a king-sized bed and the other room has a four poster. Guest Facilities: Guest lounge, guest dining room, use of the garden in summer, on-site parking, Wi-Fi throughout, ironing facilities, air conditioning, complimentary sherry. Displayed throughout the house is a selection of original and limited edition modern art which we have collected over the years from around the world. Children over 12 welcome. Children welcome from age 12. White Sails sometimes limits bookings to 2 or more days. 'Kenilworth' with super king sized bed is alive with colour and modern art, but still retains a softness to relax in. Here too we provide a large shower, state of the art bathroom fittings and stunning basins and heat pads behind the mirror for that instant demist! Kenilworth sometimes limits bookings to 2 or more days. 'Stratford' our grandest room, with super king sized bed. Decorated in cream and chocolate brown this room is stunning. Loads of room and overlooking the garden here your ensuite will impress, free standing roll top bath, twin basins and massive Matki walk in shower - you won't want to leave. Stratford sometimes limits bookings to 2 or more days. From the north (via M1/M6 and M42) or from London: Exit M40 at J15, follow A46 to Stratford-upon-Avon, take the A422/Alcester Road into Stratford-upon-Avon. After approx 1/4 mile, turn right onto Church Lane signposted Anne Hathaway's Cottage. Turn left at the mini roundabout around The Bell Pub then left onto Hathaway Lane. At the T-junction turn right onto the B439/Evesham Road and White Sails is 25m on your left. Note this route avoids the town centre. From Bath: Exit M5 at J7, take the A44 then A422 to Alcester. At Alcester take the A46 to Stratford-upon-Avon, take the A422/Alcester Road into Stratford-upon-Avon. After approx 1/4 mile turn right onto Church Lane signposted Anne Hathaway's Cottage. Turn left at the mini roundabout around The Bell Pub then left onto Hathaway Lane. At the T-junction turn right onto the B439/Evesham Road and White Sails is 25m on your left. Note this route avoids the town centre. From the town centre: Take Rother Street or Grove Road, leading to Evesham Place, then over the roundabout onto the B439/Evesham Road. White Sails is 1/2mile on your left. The nearest airport to White Sails is Birmingham. From there you can hire a car or catch a train or catch a bus. Stratford-upon-Avon train station is approximately 1 mile from White Sails. There are direct trains from London Marylebone, Birmingham Moor Street, Leamington Spa, Warwick and various other towns. Train timetables and e-tickets can be checked on-line at The Trainline or East Midlands Trains. From the train station to White Sails: Either jump in a taxi just outside the station (we are happy to arrange one for you); Or by foot, exit the station, follow Station Road out of the station grounds, turn left onto Alcester Road, turn right at the traffic lights onto Grove Road, leading to Evesham Place, then over the roundabout onto the B439/Evesham Road. White Sails is 1/2mile on your left.